Close inspection of the photographs may detect some Steel Tec , Gilbert Erector and even Marklin parts being used. I am not a purist. This site is being prepared while the project is under way. I have no way of knowing if the concept will work! ........It is therefor my first 'reality site'. The web site illustrates the many incarnations a model design can take in searching for a proper functioning system. 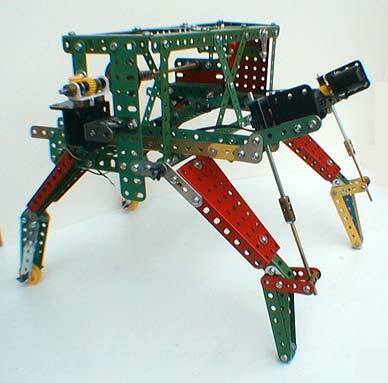 Inside the green main body a horizontal motorized screw moves a weight from one side to the other thus giving the capability of shifting the center of gravity so that either of the two front legs can be lifted and the unit remain stable i.e.. not topple over. With the centre of gravity moved to the opposite side, one leg, including the sector plate, is lifted (say) 25 mm off the ground by means of a motorized screw. The center of gravity weight is then moved to the other end and the raised leg - in fact the whole model - will (I hope) tip to the ground. 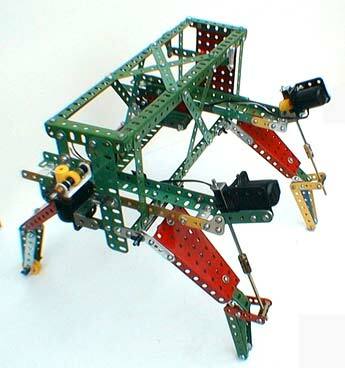 The leg is then lowered causing the machine to move forward, since the back legs have wheels under them and will move easier. A kind of clawing and pulling motion. The whole movement would then be repeated with the other leg. It should have a rolling and balancing walk - rather like a quadruped. This lower photograph shows the horizontal threaded rod side-to-side weight traverse movement more clearly. The worm-reduced motor rotated the threaded rod causing the 'nut' on the plate and strip weight to traverse from side-to-side depending on direction of drive rotation. 1. Centre of gravity shift. This arrangement had the weight causing downward deflection of the threaded rod which brought about drive problems. One way to overcome this was thought to be to carry the weight on an independent support system with the threaded rod only effecting sideways thrust. A second way is to have a pivoted weight system and this will be proceeded with. 2. At the leg lift actuation point the threaded rod engages the center tapped holes of a collar. These are not through tappings and need to have a tap run through them to give through movement.